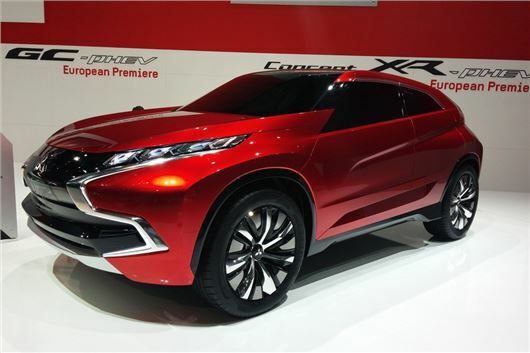 Mitsubishi has unveiled its XR-PHEV plug-in concept at the Geneva Motor Show. The front-wheel drive crossover is powered by a turbocharged three-cylinder engine, coupled to a 120kW motor and is being mooted as Mitsubishi's answer to the Land Rover Evoque. The coupe-styled XR-PHEV points towards a bold new design for the next generation ASX, with aggressive chrome lines, oversized wheels and muscular arches. Mitsubishi tells us the concept wil form the basis for the new ASX, which should make it to market before 2016. The concept uses the same powertrain system as the Outlander PHEV and can return a claimed 65.8mpg and has a plug-in range of 53 miles. The car’s 1.1-litre petrol engine has 134PS, with a high-boost converter at the front, which is supported by a high-capacity battery under the floor. The XR-PHEV also uses solar panels built into the roof to charge the auxiliary equipment battery. The car also has a variable angle spoiler on the trailing edge of the roof which can be adjusted for different driving conditions.